For many years, researchers in the foundry industry and universities have been developing testing protocols to evaluate the physical, performance and emission characteristics of prepared green sand during pouring, cooling and shakeout. This paper will review the testing protocol and methods utilized in the collection and evaluation of these characteristics that is the result of the entire metal casting process. An important criterion also is the quality of the green sand mold and casting produced (defect free) when the emission characteristics are reduced. This paper will also include the laser imaging evaluation of the castings that is the result of the green sand foundry emissions. This paper is an invited submission to IJMC selected from presentations at the 73rd World Foundry Congress, held September 23–27, 2018, in Krakow, Poland, and has been expanded from the original presentation. The authors would like to acknowledge Imerys Metalcasting Solutions for technical information and materials provided. 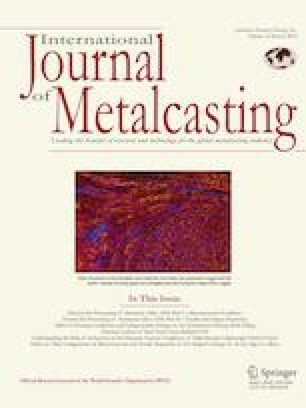 The authors would also like to acknowledge the efforts of the student employees of the University of Northern Iowa Metal Casting Center for their assistance in the experiments.